Exception of type /IWCOR/CX_DS_BAD_REQUEST: The data services request could not be understood due to malformed syntax. Please find more details in the screenshot. There’s no shortdump and it seems no authorization are missing. Caches I’ve deleted. I could not find a suitable OSS note. We’re on Netweaver 7.5 SP11 (03/18) on the frontend server and use Netweaver 7.4 SP16 in the backend server. Could somebody please give me some hints how to solve that? I think your frontend and backend components do not match with each other. 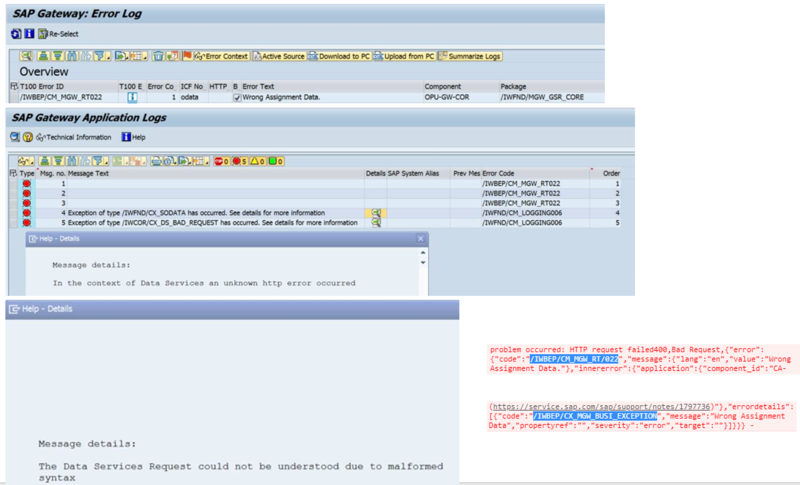 Can you check in Fiori apps library if your system has the correct frontend and backend components in the respective systems? I re-checked the components and prerequisites. Everything looks fine. Any oder idea? I trust you have taken all the steps to activate the app. Can you please provide the id of the app which you are trying to activate and what frontend and backend components you have installed on the system. txs for your feedback. A missing OSS-note solved the problem.